Dog Park USA is committed to the promotion of happy and health canine friends by advancing the awareness of responsibly maintained public dog play areas. Through the use of innovative new tools, we hope to broadcast new dog parks, and news about current parks, to as many dog loving people as we can. You are able to catch RSS feeds or even embed whole, constantly updating, regional maps into your own web site. New features will always be popping up. 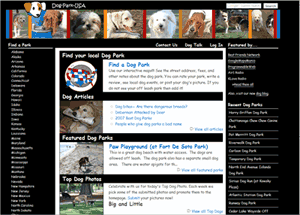 Dog Park USA was formed because couldn’t find any good sites that were dedicated to mapping dog parks. So we split the work between editor and admin to create a good technology platform and fill it with rich content. The site is a testament to the leverage Drupal gives web site developers. Since we developed this site in our spare time, our limiting factor is time. Re-inventing the wheel is not something we want to do, and with the speed, breadth and depth of Drupal, its contributed modules and its great community, we didn’t need to.